HEIs are responding to the Nursing & Midwifery Council (NMC) Consultation on Standards of Proficiency for Registered nurses. 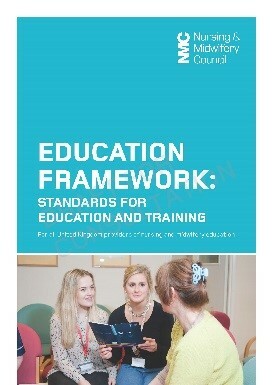 Also required is for HEIs to tell the NMC their views on the Education Framework: Standards for Education and Training. The NMC refer to their standards as being ambitious, setting out the enhanced knowledge and skills that people can expect from nurses in the future. It will be interesting to see if this view is reflected in the results of the consultation. It is interesting to look at the two documents in terms of practice learning, particularly in relation to by whom and how nurses will be supervised and assessed in clinical practice and what should be the educational requirement. A key message and what will not change from the current pre-registration standards is the fundamental requirement for partnerships between HEIs and healthcare organizations to provide the practice based learning for the student nurse. What seems to be absent from this new consultation and draft document are the prescriptive elements for the education and on-going continuing professional development needs of educators and assessors of student nurse in practice. The current requirements for mentorship are set out in the 2008 NMC Standards to Support Learning and Assessment in Practice: Preparation for Mentors, Practice Teachers and Teachers, and have led to the proliferation of credit and non- credit bearing programmes that prepare the qualified nurse for the role of mentor. Prescriptive annual updates are also required in order to comply with maintaining ‘live’ mentorship recognition. In the current NMC education framework consultation document, new roles are introduced such as practice supervisor (Pillar 3), educator and assessor (Pillar 4). When reading this document is it clear the difference in roles and preparation for the role? “Our education framework and the new requirements for learning and assessment provide flexibility for approved education institutions, practice placement and work placed learning providers in developing innovative approaches to education for nurses and midwives while being accountable for the local delivery and management of NMC approved programmes in line with our standards” (NMC 2017:5). Is this statement permission by the NMC for entrepreneurialism or are they being vague with no real ideas of their own? Taking a position that the NMC are offering some flexibility regarding practice based learning, timely is the need for HEIs and healthcare organizations to work collaboratively and to set their benchmark for quality teaching and learning. Reconsidering models of student support is imperative. This includes the use of coaching as opposed to mentoring and to redefine the practice roles required. Be creative and entrepreneurial adopting service improvement and transformation tools and techniques. Flexible should not mean reduced quality. Indeed, Health Education England whose wider remit for ensuring that there are high quality learning environments for all healthcare learners in England makes clear their expectations of what constitutes a quality clinical learning environment. Within the Greater Manchester we are in a strong position, already adopting coaching approaches to supporting student clinical leadership development. The Greater Manchester Practice Education Group that is attended by all 4 HEIs and healthcare practice organisations provides the platform for leading innovations in healthcare delivery models. Clear is the need for academic leadership to deliver on any new models of education and to create the culture shift required. What do you feel are the top 3 leadership behaviours required to affect change and to change cultures for practice learning?